The graphs I note a discrepancy for in the initial post are for different things. The first is consumption Per Capita - which must include commercial and industrial consumption OR it would need to indicate there is less than one person to a household. I work with data and sometimes we discuss the poor data design, and data management practices, related to energy reporting in Ontario. Since 1990, average household electricity consumption has declined by almost 25 per cent, representing about $350 in savings each year for the average household, based on current electricity costs. Look at that graph carefully, keeping in mind 12,000kWh in 1990, <10,000 in 2013, and separate sourcing from NRC and the OEB. Previously Ontario had a Chief Conservation Officer, before the position was rolled into the rest of the Ontario Power Authority. They showed higher demand in 1990, and a drop from ~12,000kWh to ~10,000 would have occurred since only 2007- if the numbers are comparable. Why does data quality appear to be degrading? 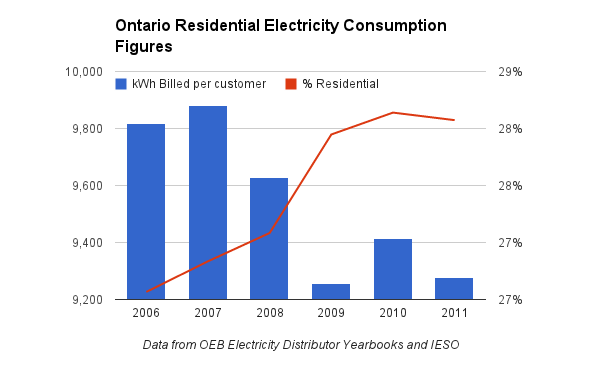 I should have done the leg-work before I first posted without seeking out the best data I knew of, which is the Ontario Energy Board's Annual Yearbook of Electricity Distributors. The data is compiled from reporting by local distribution companies and I have summed up the "Statistics by Customer Class" tab or each year's spreadsheet to calculate figures on average residential consumption. I also showed the total as a percentage of what the Independent Electricity System Operator (IESO) reports as Ontario Demand - mainly because I thought residential demand was closer to 40% of total Ontario demand and wanted to note the discrepancy. The data used for the last graph is here.